Kefalograviera is one of the newer Greek cheeses. Production was started in the 1960s and it has quickly become a favorite table cheese. 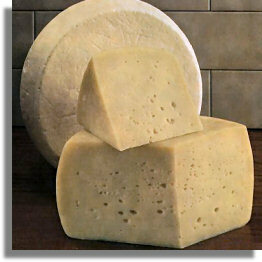 The taste of this hard cheese is salty, somewhere between kefalotyri and graviera, hence the name. It is made from sheep’s milk. Kefalograviera is sold in wheels or wedges. It has a light brown rind. It can be found at Greek or Mediterranean markets, and a low-fat variety has recently come on the market. While prized as a table cheese (appetizer, meze), kefalograviera can also be used in saganaki (fried cheese), as a roasted cheese, or grated.